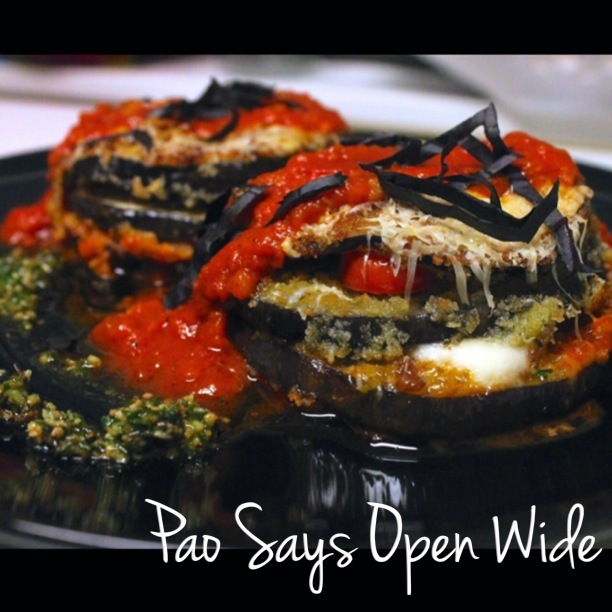 Leggo my Egg(plant): Eggplant Parmesan – Pao Says, "Open Wide!" Have a sheet pan or tray to put your breaded eggplant slices on. Once everything is breaded, heat up a large frying pan with some olive oil- there should be enough to cover the whole bottom of the pan. Once the oil is hot, put in your first batch of eggplant to fry. These cook up fast so keep an eye on them- flip after about 1-2 minutes. You should see the fried side looking nice and golden brown. Once fried, set aside on a plate lined with paper towels to soak up the excess oil. Once all of your eggplant is fried, it is time to assemble your little towers. In a sheet pan or aluminum tray (easy cleanup with these!) pour enough marinara (Rao’s sauce) to coat the bottom. (In reality, you can use whatever red sauce you have handy, but this sauce is just so good and I’m hooked… So I either home-make sauce or use this brand). Lay down the bases to your towers… These should be the largest rounds. Lay down a spoonful of sauce and some mozzarella cheese on top of these eggplant rounds, and then later on the next slice. Spread some pesto (or lay down 2-3 basil leaves) and then layer on your halved grape tomatoes (I used 4-5 halves fanned out on the eggplant slice). Finish your towers off by placing a smaller slice of eggplant on top and top with some sauce and some Parmesan cheese. Pop these on the oven for about 15 minutes or until you see the cheese start to bubble and turn golden brown. I topped mine with a spoonful more of sauce and some purple basil for garnish.